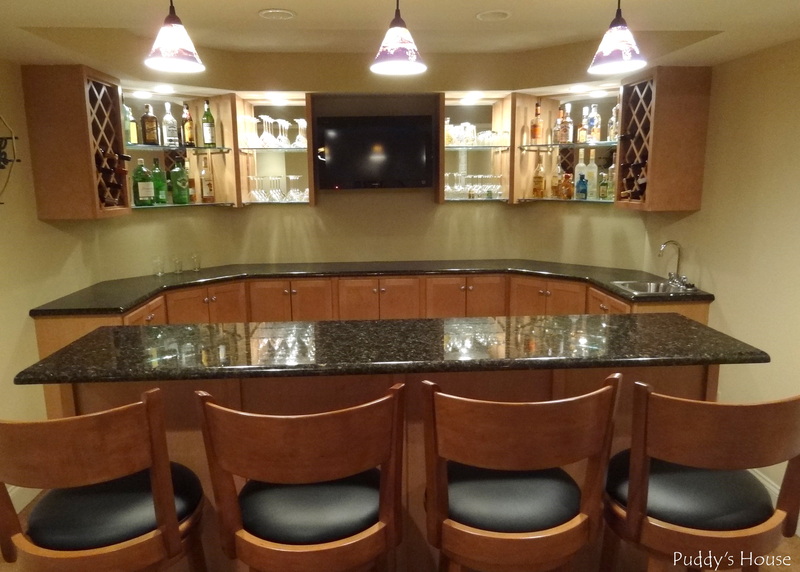 When we had the bar built in our finished basement, we knew we would eventually want to tile the backsplash. But, we didn’t worry about having our contractor do it, because we knew we would be able to DIY it in the future, since we had done it before. 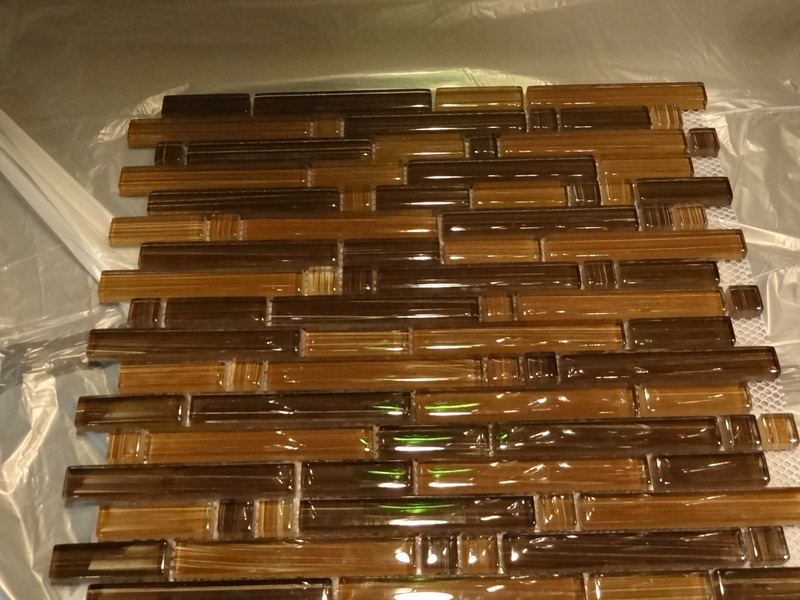 So, several months ago we began our search for a tile to complete the backsplash. We looked at the normal places, Lowe’s and Home Depot, but didn’t find anything that was even close to being an option. Then we remembered another local place, Fleming Tile & Marble, which is where we had gone to pick out our granite for the bar. Bob and I went there and it didn’t take long for us to find what we wanted. 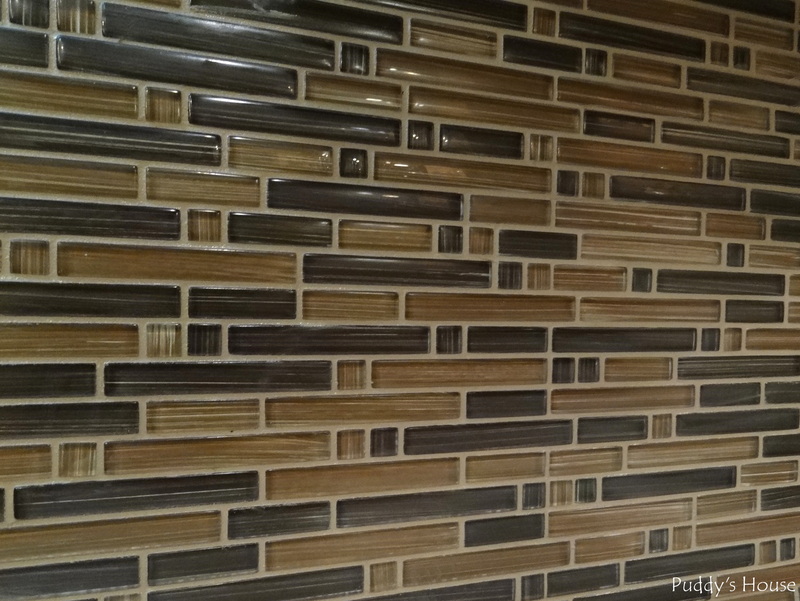 It was a glass bamboo mosaic tile by Bella Vita Tile. 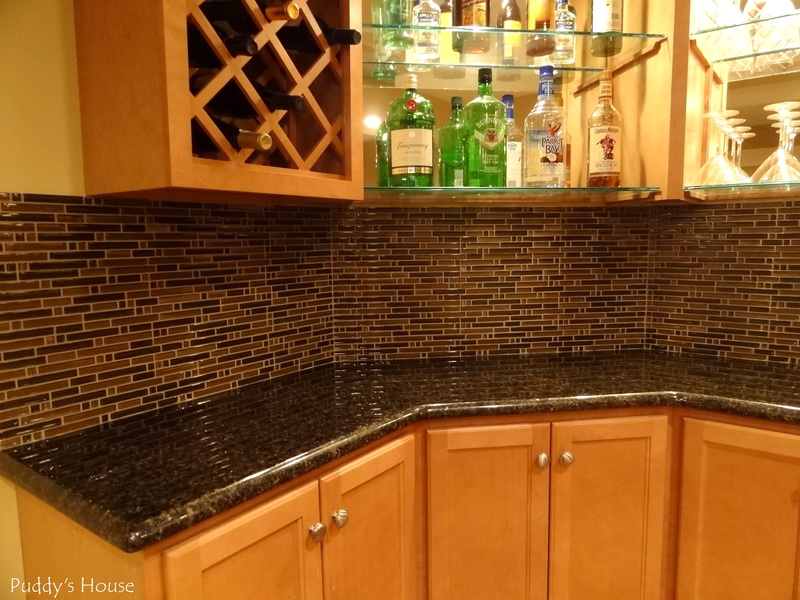 It tied in the colors of our granite counter with the floor tile and the color of the cabinets. The website on the box said www.bellavitatile.com, and below are the details from the box. 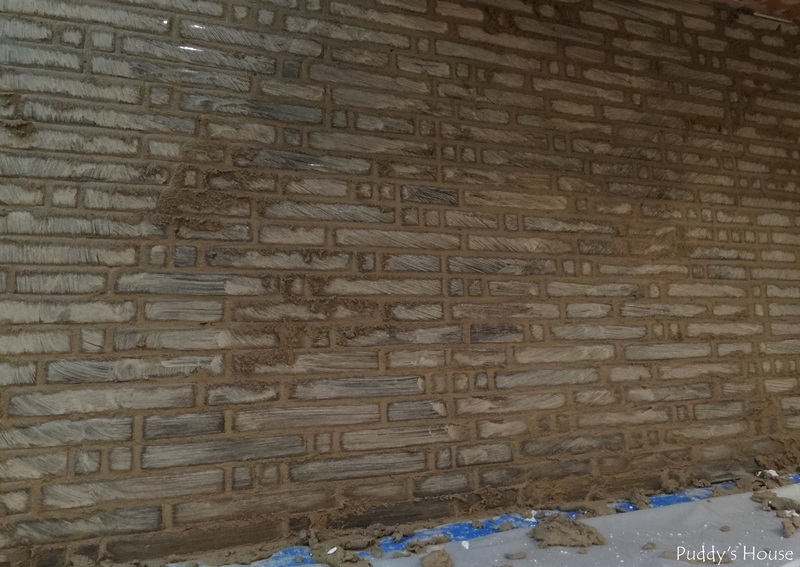 After having the tile sit for months in the house….we were saving it for one of our winter projects, we finally got to work on it in January. 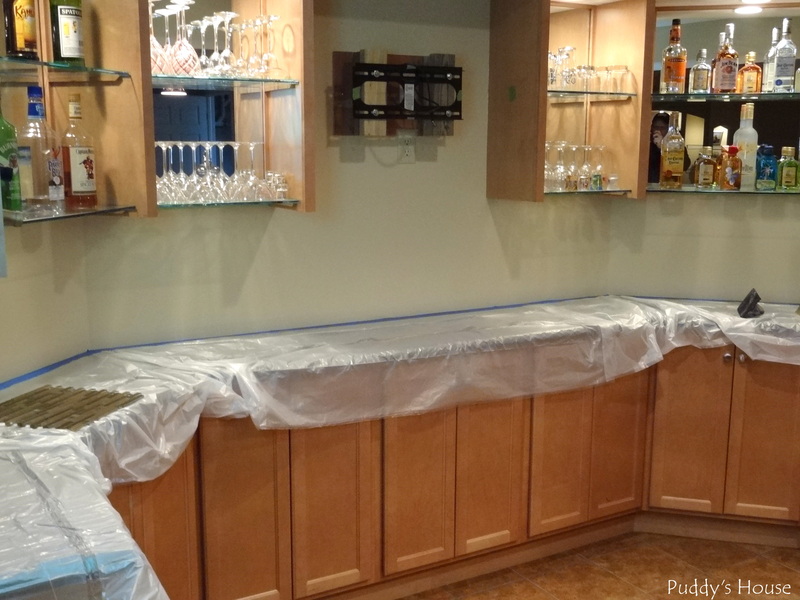 We started by prepping the bar area to protect the granite counters. We used plastic drop cloths and painters tape to cover the counters. 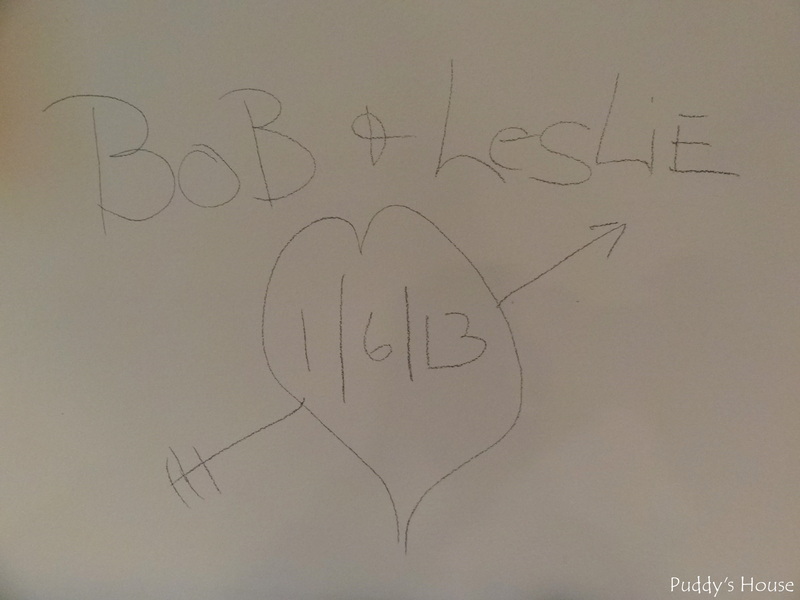 We kept our tradition as we did upstairs and marked the wall before we started tiling. This gives away my slow turnaround time on blogging, but it did take several weekends to complete all the steps. We bought a small bucket of adhesive at Lowe’s to use to adhere the tile. With the glass tile, the only advice the tile shop gave us was to make sure we used a white adhesive so that it didn’t show through the tile. To make sure we had a straight edge that lined up along the bar edge, we secured a 1 x 4 on the wall and made sure it was level. Bob and I both worked on placing the tiles. He is better at applying the adhesive than I am. We did use our tile saw to make the cuts as needed. A word of caution…glass tile can make sharp glass shards! If you attempt to DIY with glass tile, please use safety gear such as safety glasses and gloves. We were wearing safety glasses at first, but never thought of gloves until Bob was using the tile saw and a shard flew directly into his thumb. Fortunately, he didn’t need stitches, but it was painful and we had to keep it tightly bandaged. So, because of our extra safety measures, I did not stop to take any pictures of us cutting the tile. We also learned it was easier to cut with both sets of hands. Bob “fed” the tile through the saw and I held up any portion that hung over the edge to keep it level and take the pressure off it hanging over the edge of the saw. That method worked the best for us. Once we got going it moved along pretty quickly. I’m the one who did all the measuring and tile placement. It was a bit like putting together a puzzle around where the TV is normally. No one will ever see it, but we did fill it in completely. I just saved that part until the end and used all the random pieces to fill in the spaces without as many cuts. My initial calculations were pretty close. We had ordered 2 spare tiles, and that is what we had leftover, plus a few cut portions. We got all the tile placed in a few hours. But, it had to wait until the next weekend until I had time for the grout. Our grout color is Desert Khaki. Bob mixed it up for me in an old dishpan I had. 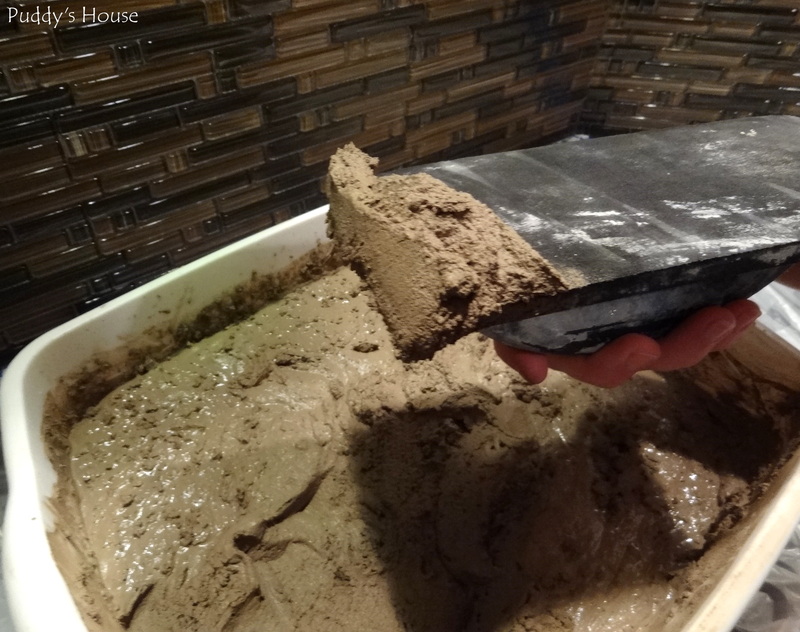 I read on other blogs that the grout should be the consistency of peanut butter, so we added a bit more water than the instructions said. Grouting is a one-person job in our house, so once Bob mixed it up, I got busy grouting the tile. Grouting only took a couple hours in total. It really is the most tedious part of the process. I followed the directions on the grout by leaving it on for 15-20 minutes and then wiping off with a sponge. It was easy to see as the grout was drying too. At one point I started wiping it off too quickly, and it was not a good idea. It needs that amount of time to set. And, I also learned to leave it look hazy for 3 or more hours and then wipe it clean. The finished look is well worth the time and effort. We had the most delay in our final clean-up step. 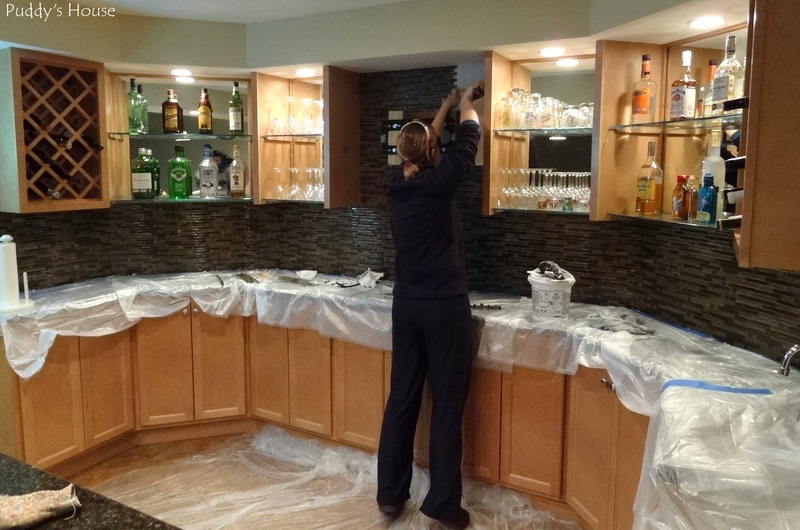 While the tape and plastic provided the protection we needed for the granite during the tiling process, it provided quite a struggle in the clean-up process. 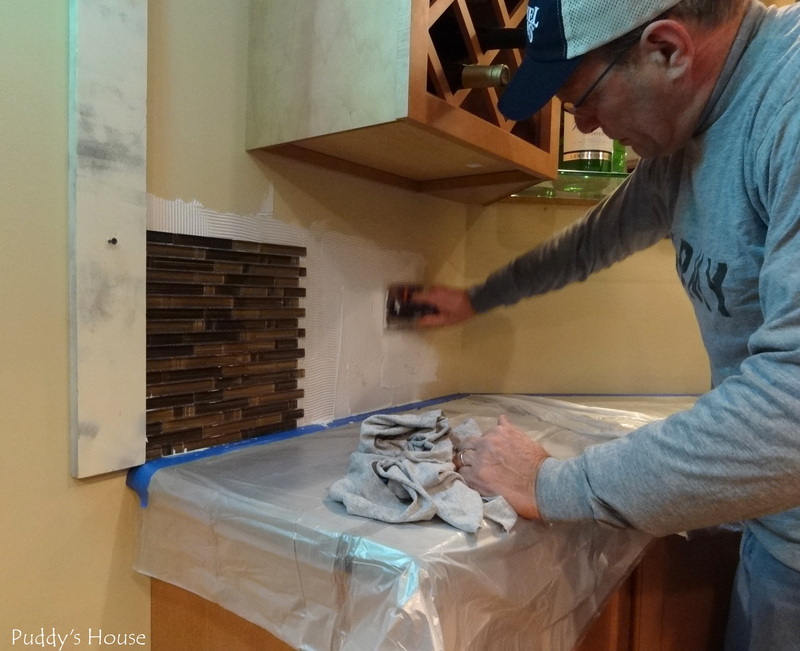 Since we placed the tile and grout directly on top of the counter, the tape was stuck there. Bob had to use a knife and razor blade to remove the tape and plastic to get a really clean edge. But, it was well worth the wait. 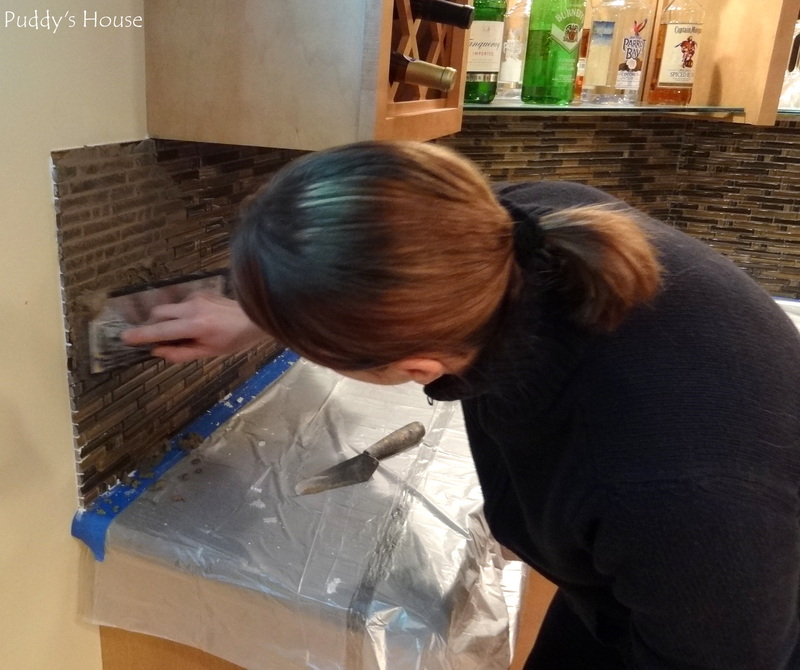 Our only remaining step is probably to add a strip of caulk where the tile meets the counter. And, we are considering adding a trim piece along the raw tile edge. 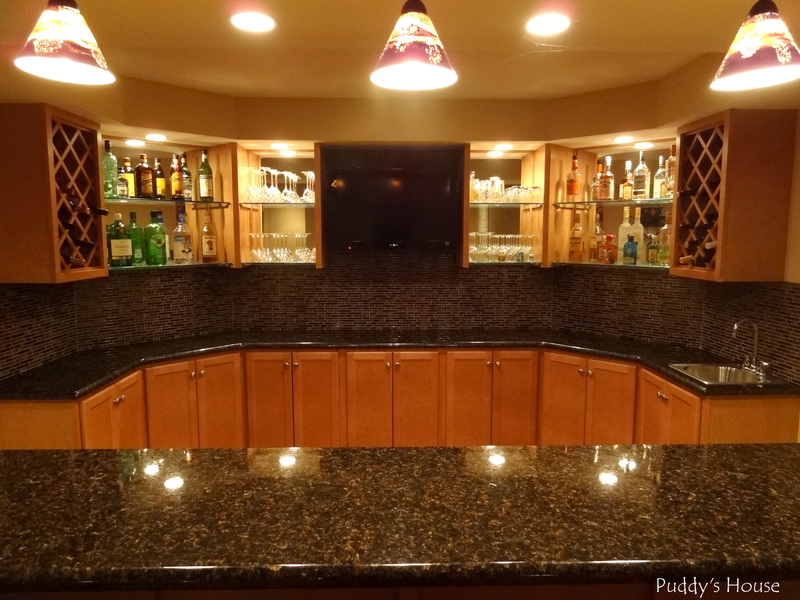 The backsplash has really transformed the look of the bar. 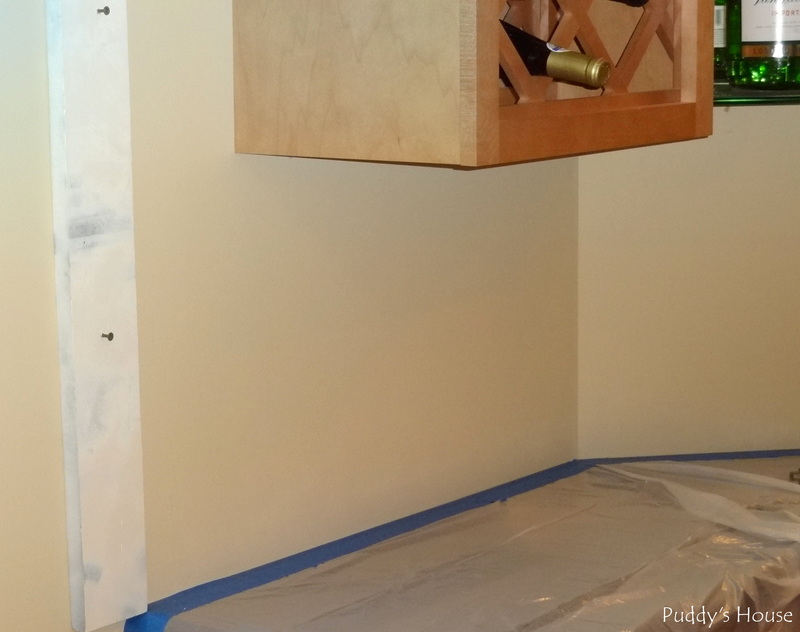 It’s amazing what some tile, grout, and a bit of DIY can do to change the look of a space. We love the final results. 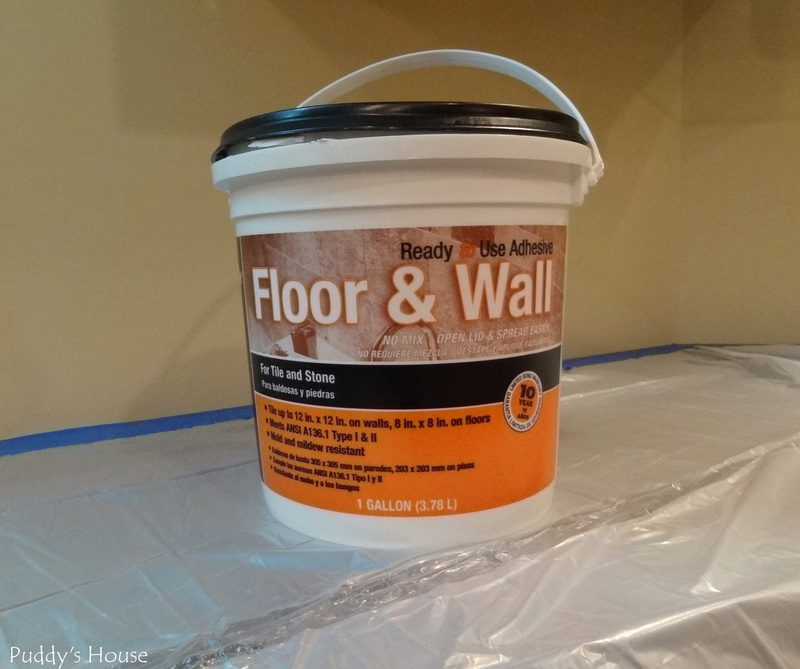 So, how about you, and other DIY tiling stories to share? Any suggestions on what type of trim to use on the raw tile edge? Thanks Terri! 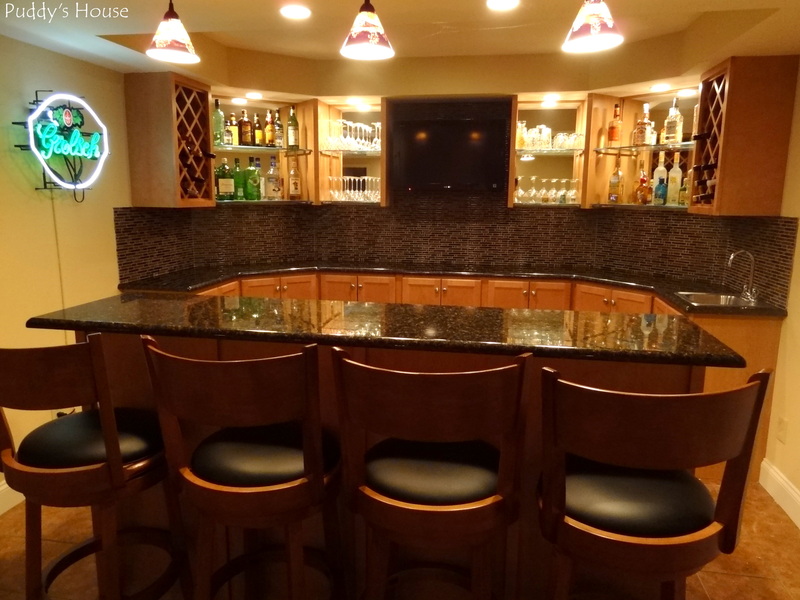 We knew we wanted that area to be our bar almost immediately…we couldn’t pass up taking advantage of the interesting space.